Whew! Sorry it's been a while but the last couple weeks have been crazzzeeee. I started a new job. I had my 29th birthday. And also... Ok, stop laughing you guys. Now, we know that many of you think we are crazy but you have to see the pictures below. 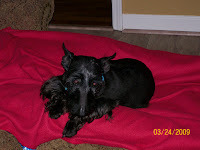 We are fostering a little Scottish terrier named Bonnie. Now, as if that isn't enough, she is pregnant with a single pup. 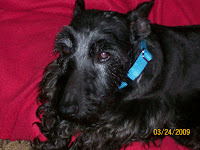 Our friend, Mary Lou, who connected us with the paws4people group, brought her to our attention. She was abused and we will be taking care of her and the pup until the little one is weaned. Then, they will go to a good home (other than ours, of course). Anyway, enjoy the pictures. If, by any chance, you are interested in adopting her or the puppy, let us know and we will get you in touch with Mary Lou.